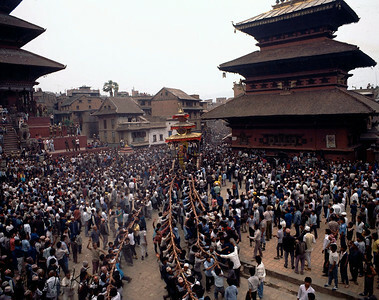 Bisket Jatra (Bisket festival) is a celebration of victory over the snake gods that ruled the valley in the time of prehistory. It is believed that most of the nagas, or snake gods, evacuated the Kathmandu Valley with the prehistoric draining of its great lake, but a few remained, great serpent kings dwelling in the rivers and the ponds, wielding that most significant of powers, control over rainfall. On Bisket, “snake slaughter,” all the spirits of the gods descend on Bhaktapur, where an eighty-foot lingam (pole) carved from a tree stands fluttering with banners. The banners represent two serpent demons slaughtered by a prince of Malla Dynasty, when they emerged from the nostrils of his sleeping princess. Crowds follow a procession of two heavy chariots, one carrying Bhairav, the wrathful form of Shiva; the other Bhadrakali, the bloodthirsty form of Goddess Parvati (Lord Shiva’s consort). The crowd divides into teams for a tug of war between the chariots. The winners will have good luck in the coming year. Finally, more straining teams compete to bring the giant lingam to earth. The moment it crashes, the old year dies, and so do the snake demons. The Nepalese New Year begins. 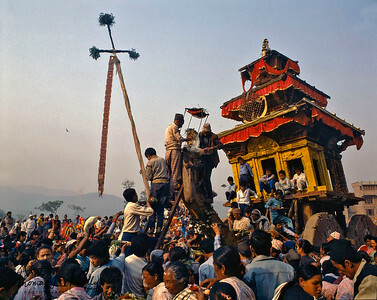 Bisket Jatra (Bisket festival) is a celebration of victory over the snake gods that ruled the valley in the time of prehistory. It is believed that most of the nagas, or snake gods, evacuated the Kathmandu Valley with the prehistoric draining of its great lake, but a few remained, great serpent kings dwelling in the rivers and the ponds, wielding that most significant of powers, control over rainfall. On Bisket, “snake slaughter,” all the spirits of the gods descend on Bhaktapur, where an eighty-foot lingam (pole) carved from a tree stands fluttering with banners. The banners represent two serpent demons slaughtered by a prince of Malla Dynasty, when they emerged from the nostrils of his sleeping princess. Crowds follow a procession of two heavy chariots, one carrying Bhairav, the wrathful form of Shiva; the other Bhadrakali, the bloodthirsty form of Goddess Parvati (Lord Shiva’s consort). The crowd divides into teams for a tug of war between the chariots. The winners will have good luck in the coming year. Finally, more straining teams compete to bring the giant lingam to earth. The moment it crashes, the old year dies, and so do the snake demons. The Nepalese New Year begins. 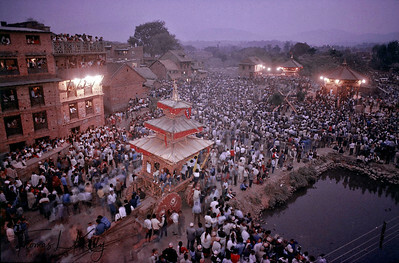 Bisket Jatra Festival. 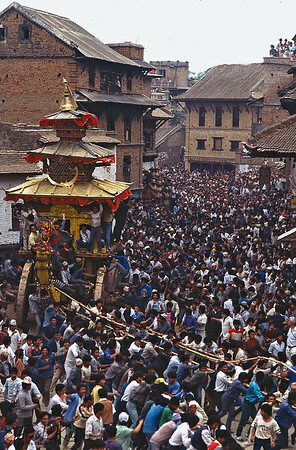 During April's nine day new year festival in Bhaktapur, residents from east and west sides of town stage a frenzied tug-of-war, pulling a huge chariot containing the Hindu deity Bhairabh. Bhaktapur, Nepal. 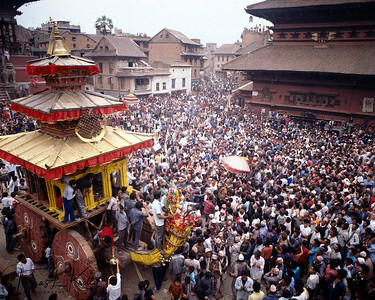 Bisket Jatra (Bisket festival) is a celebration of victory over the snake gods that ruled the valley in the time of prehistory. It is believed that most of the nagas, or snake gods, evacuated the Kathmandu Valley with the prehistoric draining of its great lake, but a few remained, great serpent kings dwelling in the rivers and the ponds, wielding that most significant of powers, control over rainfall. 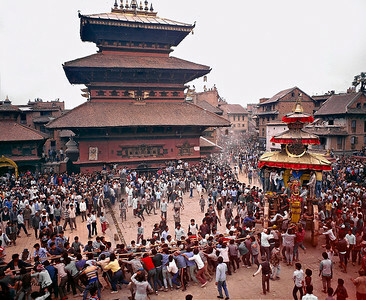 On Bisket, “snake slaughter,” all the spirits of the gods descend on Bhaktapur, where an eighty-foot lingam (pole) carved from a tree stands fluttering with banners. The banners represent two serpent demons slaughtered by a prince of Malla Dynasty, when they emerged from the nostrils of his sleeping princess. Crowds follow a procession of two heavy chariots, one carrying Bhairav, the wrathful form of Shiva; the other Bhadrakali, the bloodthirsty form of Goddess Parvati (Lord Shiva’s consort). The crowd divides into teams for a tug of war between the chariots. The winners will have good luck in the coming year. Finally, more straining teams compete to bring the giant lingam to earth. The moment it crashes, the old year dies, and so do the snake demons. The Nepalese New Year begins. 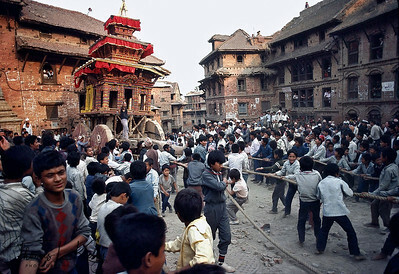 During April's nine-day new year festival in Bhaktapur, residents from east and west sides of town stage a frenzied tug-of-war, pulling a huge chariot containing the Hindu deity Bhairabh. Later, the chariot containing is hauled into an open area near the Hanumante River, where an eighty-foot pole is erected, adorned with two banners representing serpents, only to be felled the next day to mark the new year. 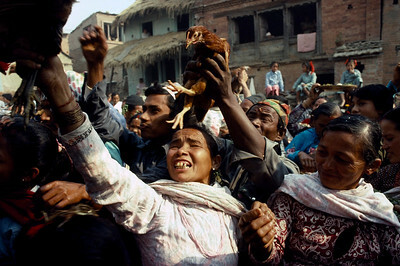 Throughout the day, Bhaktapur residents offer live fowl for sacrifices to the bloodthirsty Hindu deity, Bhadrakali. Bhaktapur, Nepal.